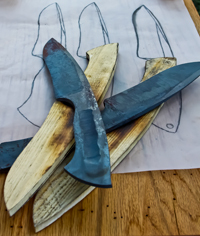 Hand-forging and heat treating a knife is an extensive process. It takes hours of labor and days to go from billet to blade, but the finished product is well worth the wait. Hand-forged, high carbon steel knives that have undergone proper heat treatment are extremely tough and hold an edge that most production blades simply cannot match. 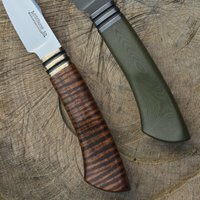 Every knife we forge must meet rigorous performance standards, and each hand-forged Guinea Hog Forge knife is a unique creation born of fire that includes a "JS" after Scott's maker's mark to certify that he is an ABS Journeyman bladesmith. DESIGN: Scott begins the hand-forged process by drawing a design on paper. Then he crafts a wooden mock-up to ensure that the design feels right in the hand. During forging the mock-up is used as a design guide. Note the burn marks on the mock-ups and you'll see where Scott is constantly touching metal to wooden mock-up during the forging process. STEEL: At Guinea Hog Forge we currently use O1, W1 and 52100 carbon tool steels to make our plain steel knives, and 1095/15n20 to make our pattern-welded (aka Damascus) blades. 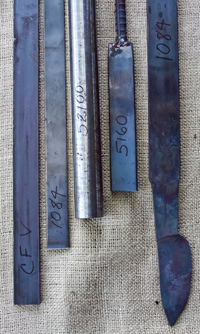 Each type of steel has unique properties that yield different qualities in a knife, and Scott is constantly acquiring knowledge about these differences. He is an avid researcher and does in-house experiments on the steels we use to refine the process of blade production and to assure you the best possible product. It is important for you to know that carbon tool steels will rust if not cared for properly. If heat treated correctly, hand-forged carbon steel blades will out-perform most stainless steel production knives and are much easier to keep sharp, but high carbon blades are not immune to corrosion. 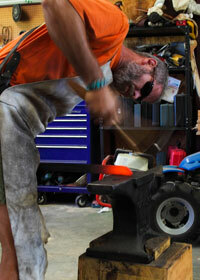 At Guinea Hog Forge we produce high performance tools. Treat them with care and they will last a lifetime. 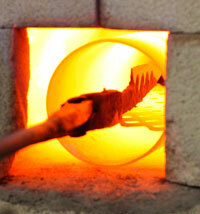 FORGING BLADES: Forging is the art of shaping metal using localized compressive forces. Scott uses a combination of blacksmithing hammer, muscle, and a power hammer to rough forge knives and create Damascus. 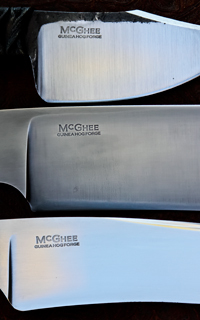 Every hand-forged McGhee blade receives his Journeyman "JS" smith stamp and is a unique artisanal creation. GRAIN REFINEMENT: At Guinea Hog Forge we refine the grain of the metal in our hand-forged carbon steel blades through a 3-step process that involves NORMALIZATION, a primary QUENCH, and SPHERODIZATION of the blade. 1) NORMALIZATION relieves stresses that have built up in the metal during the forging process. At Guinea Hog Forge, we normalize our blades by bringing them just past critical temperature in the Sow's Belly (our special heat treating forge), and then allow them to cool slowly in still air. This is done multiple times. 2) At Guinea Hog Forge we QUENCH the steel after normalization to dramatically refine grain structure. This is done by bringing the knife to austenitizing temperture in the Sow's Belly, and then plunging the blade into a commercial quenchant (a liquid) to rapidly cool the metal below 600 degrees F. This step is repeated at least twice. 3) After quenching the blade, we SPHERODIZE the blade to by heating it to just below critical and allowing it to cool slowly. This removes all stress and makes the knife easier to rough grind. ROUGH GRIND: Once grain refinement is complete, Scott finalizes the blade's shape on our Wilmont Grinder. At this stage, what started out as a hunk of steel truly looks like a knife but isn't quite ready to be called a knife by Guinea Hog Forge standards. HARDENING: This is where the knife is truly born. Before now, what looked like a knife was only a knife-shaped piece of metal. To fully harden our hand-forged blades, we put the knife back in the forge and bring the metal to just past critical one last time. 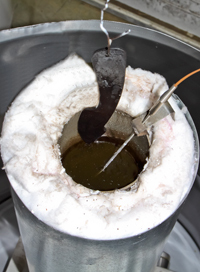 Once past critical, the blade is removed from the forge and quickly dipped in a commercial quenchant to cool the metal rapidly and begin the formation of Martensite (a very hard steel crystalline structure). TEMPERING: At this stage in the Guinea Hog Forge heat treating process, we temper our hardened carbon steel blades in a low temperature salt tank twice for 2 hours per cycle to convert all untempered Martensite into tempered Martensite. Hardened blades must be final tempered to prevent cracking and make the knife tough for everyday use. FINISHING: The last process in creating a blade involves establishing a finish. Scott can apply a simple final finish with his belt grinder or more comple finishes. Other options include forge-finished (hammer-marked), hand-sanded, hand-sanded and etched (for Damascus), or a combination of the above plus various chemical treatments including Parkerization. MARKS: Scott's hand-forged knives get marked with E. Scott McGhee-Guinea Hog Forge plus an "MS" symbol to certify that it was hand-forged by an ABS Master bladesmith. If you have a knife with a similar mark, but a "JS" rather than an "MS," this knife was made while he was an ABS Journeyman Smith. If the mark is followed by the Chinese symbol of water, you have a stock removal knife made when he was a JS. TESTING: All hand-forged blades are subjected to appropriate cutting and chopping tests prior to distribution to assure that our knives are not only sharp, but also durable. We chop everything from 2x4's to onions to assure that the blade you buy is ready to perform the tasks it was designed to handle. 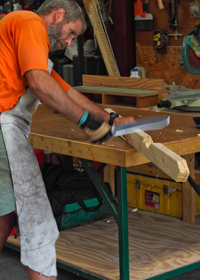 HELVING: Once a blade is ground to a finished shape and tested, Scott crafts a handle. Micarta, stabilized wood, and other natural and man-made handle materials are available at Guinea Hog Forge. Each handle is custom shaped and then finished by hand. Each material has its own properties and costs vary dramatically. Phenolics like Micarta and G-10 are the most durable, but wood and other natural materials have very appealing aesthetic features. 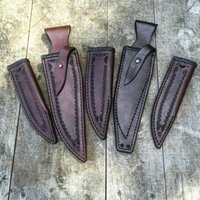 SHEATHS: At Guinea Hog Forge we currently produce all our own sheaths from either Kydex or leather. Kydex sheaths tend to be less expensive and more durable, but leather has a very pleasing look and feel. Leather can be stamped, dyed, and lined, and most hand-forged blades come standard with a leather sheath. 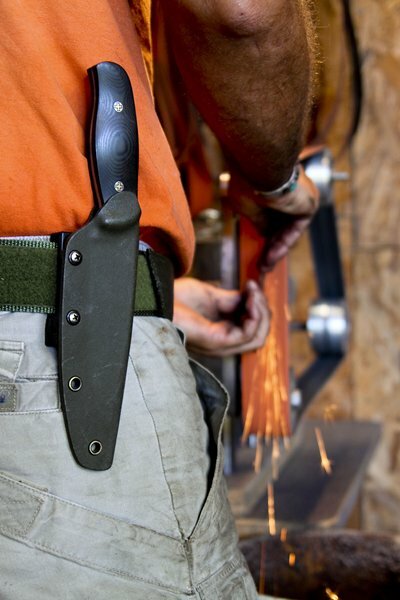 Simple Kydex belt sheaths can be produced, as well as more complex shoulder holster and cross-draw rigs with linings. Contact us directly to discuss all available sheath options.